The official The Abandoned Soldier website is currently down. This is due to the current web hosting WEBMANIA making life difficult for us to transfer the domain to another provider. They have now been threatened with legal action and trading standards have been informed. This Blog will be kept up to date on all the latest TAS news as well as our Face Book Group. Need an impressive backdrop for the opening of the 6 Nations coverage? Look no further than TAS in Cardiff Castle Firing Line Museum. While we appreciate several seconds of National media coverage from the BBC, it would be nice if they would one day answer an email that has been sent to BBC Breakfast, BBC News, etc etc. On the 6th November 2010, ‘The Abandoned Soldier, Reflections of War’, was launched at The National Memorial Arboretum at Alrewas in Staffordshire. The Readings were carried out in The Millennium Chapel and was attended by approximately 60 people. A selection of verse from the book was read by; Owen Black, Angharad Rogers, Kate Wood, Jean Luc Alvarez and Lucy Metcalf. The author also spoke some words and James Napier elaborated on the inspiration and reason behind the materialisation of the sculpture, ‘The Abandoned Soldier’ (TAS). Alison Jones provided a superb rendition of her song; ‘The Soldier’s Wife’. BBC Central news and reporters from The Daily Star and The Daily Express were present. To sum up the day the TAS project received a gracious welcome from the NMA, its staff and all of those who were in attendance and all those who took part. A success in some small part, though the greatest mountains are yet to be climbed. 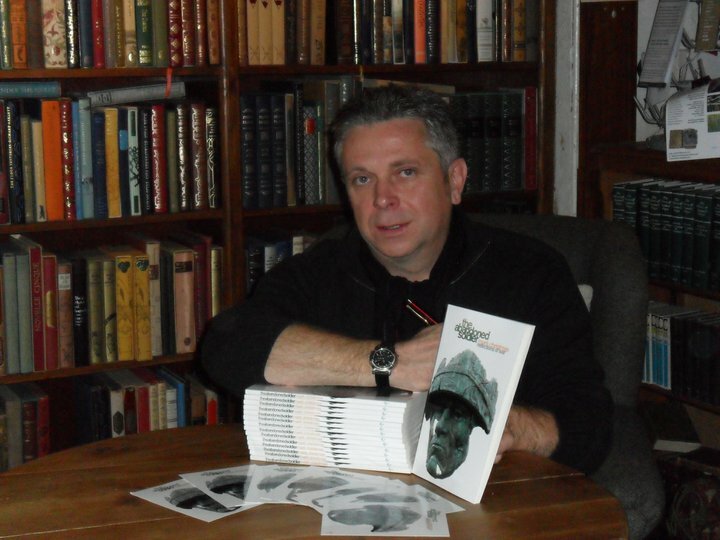 A signing arranged at Waterstone’s Books in Abergavenny. On arrival I was greeted with , ‘There are no books to sign’ an apparent lack of communication with the Waterstone’s central hub. No real apology and no re arrangement to date. I offer a personal apology to all those who took time to turn up and were disappointed. If signed copies are requested please speak to Helen at Silverwood books and I will be only too pleased to help. but only cold and sleeping. against the black of the velvet night sky. If there had only been one book sold and this man had bought it, then, that is thanks enough because I met this man and shall meet him again. So thank you for a first foray into Hay as a poet and to Booths Books the most classical of bookshops. If you are there go and see it, you will see what I mean. An apology started the day to Josephine at Verzon Books in Llandrindod Wells. I was mediating between the media and the NMA. Context can be so crucial and we often seek not to see how many there are in the language we speak. I arrived out of breath slightly late to a welcome cup of tea. So my utmost thanks to Verzon for another fantastic day and too all those who came and said hello. A cold Saturday morning in November and a Station that had not been used for purpose in many many years greeted us with the new day and Michael. Erwood Station Arts Centre made us feel welcome. Teas and Coffees all round. Again thanks to those who came, Tony from RBL Builth Wells and to my friend Maureen whom I met last year whilst listening to Wendy Cope read. Welcome faces as you walk in from the cold. So thank you to all whom gave time and effort to make this possible and engage in the bigger picture. Thanks to all those who give time and effort and so much more to engage with the TAS Project. We need a national memorial so we can remember the sacrifice of the war” living”, and not just those who have died. After visiting the NMA a few times, I am convinced this is the right place for it. Andy Lorimer – Edinburgh……18yrs in the Military and medically discharged with chronic PTSD. PTSD…. The unseen wound! Just because you can’t see it, doesn’t mean it doesn’t exsist, same goes for all the other unseen & abandonded soldiers, because you can’t see them…..
A national memorial to The Abandoned Soldier is a tangible, visible and essential reminder! Keep up the excellent work Mark. Melanie Griffiths – Wales – I lived with someone with PTSD! I hadn’t heard of this disorder until then, the more we make others aware the better, I totally support The Abandoned Soldier and all it’s aspects! stephen catterall from Preston, lancs, living in Northern Ireland. Ex soldier, I know many ex service men and women that have suffered and still do, no more needs to be said. I am also privileged in knowing Mark Christmas personally. The work he and all others will not go unnoticed if there is any justice in this world. Jan Wilkins (writes as Jan Hedger) Bexhill on Sea, East Sussex. PTSD hits where it hurts. This is one worthy project, to at least respect that pain and the soldier it hurts. This is such an important message to get out there. PTSD is an aspect of war that needs to be recognised and de stigmatised, it can effect anyone and raise its head at any time after a traumatic event. After my 10yr’s service I have had sever problems with PTSD though it took around 7 years for me to be diagnosed. Luckily for me I have a wonderful wife who is also a Clinical Psychologist to help me. I was doing pretty well up until a couple of years ago but due to breaking my back in 08 I have Central Pain Syndrome & am now in a wheelchair, also now PTSD has come flooding back. I am just about holding on at the moment just going hour by hour. PTSD’s black dog can bite at any time the more It’s recognised the more chance we will get effective treatment and understanding. Thank you guys for raising the awareness of this debilitating and life threatening condition. Just because the wounds cannot be seen does not mean people don’t suffer. They are bleeding on the inside with PTSD. I am privileged to have been able to speak to a few x serving men who are suffering from this condition. It is their right to be heard. As an ex serviceman with 2 sons in the Royal Marines, I fell very strongly on this subject as it could have been me or maybe my sons in the future (God forbid). It is the fact that this is not a visibal wound does not mean it is not there and its about time the poloticians who make the decisions to send our troops into conflict realise that they are DUTY bound to ensure those who suffer and their families receive FULL medical and financial support. The “Abandonded Soldier” is an excellent reminder. There are an impressive number of memorials already in place at the National Memorial Arboretum and if The Abandoned Soldier is, for any reason, not deemed suitable for the Arboretum then it is a disgrace and those in charge should be ashamed. This is one of the best things we can do for those who do fall victim to this debilitating illness. We all have seen things during service that could come back to haunt us but are lucky enough to have not. Keep up the good worl let us stand up forthose that can not. Add me to your List!!! Amy Brady, Newport, Washington, USA. The Abandonded Soldier transends generations AND borders- TAS is the face of PTSD. Strong. Proud. Silent… and broken. We also had some great comments on the Independent On Sunday website. Phil Bennet -I do think its a marvellous idea, as a veteran myself I back anything that highlights the plight of members and ex members when they make the transition back to Civvy St. I just wonder why a permanent home wasnt sought before the sculpture was finished? Cotswold 72 – It is very important that this wonderful sculpture is found a permanent place and the NMA is perfect! £75, 000 for the bronze sculpture is a drop in the ocean, a lottery grant would be good! PTSD is horrendous and the treatment and support for both serving and ex serving service personnel is just not good enough. We as a nation really do need to appreciate and pay respect to these brave men and women who put themselves in harms way to keep us safe! PTSD is not new, it has been around since the First World War when it was known as Shell-Shock and who knows, before that even. At least we talk about these issues more openly now but we still have a long way to go before we can truly appreciate what these men and women go through, Mental Health problems are nothing to be ashamed of and its something that can effect any one of us at any time in our lives! Its hard to imagine as a Civvie what the Troops go through and witness whilst on active service but it has to affect them in some way or another. Some are lucky enough to get through it but others are less fortunate and will be touched by PTSD. Combat Stress work so hard in helping those sufferers but they need more money and more help!! The Governemnt and MOD need to do more!! I hope to get to the NMA next month and see this beautiful sculpture and also to pay my respects to All the Fallen. Also I’ll be thinking of all those who have been wounded who we do not hear much about and wishing them a speedy recovery and sending best wishes to those currently serving out in Afghanistan, stay safe!! and thankyou for all you do!! Ken_Plym – It seems to me that just £75.000 is just loose change these days, Yes the Lottery Fund could finace it, but shouldn’t the Government do this, after all its them who destroy these young mens lives after all. These Chaps risk everything including their sanity for this Country and its people and all of our safety, surely we should show some respect and pay for this to have a permanent home, and we as a Nation should give ALL our support to these brave lads and lasses who not only put their lives on the line for us, but also their future, they deserve our support, so come on “Call Me Dave” put our money (Taxes) where your sentiment are! Words are not enough Prime Minster Action speak much louder. Sue Black – The focus should not be on the cost of the statue but the message that it sends out to all the service men and women. The statue is representing the serving personel and ex serving personel who are left with internal and external scars as a result of conflict. I have also been to visit the statue and feel that it should be preserved for future generations to see what these young people have gone through in serving their country. For more information on this I would recommend that you visit the the abandoned soldier website or the link through facebook. It’s a fascinating project and more people should be aware of it. 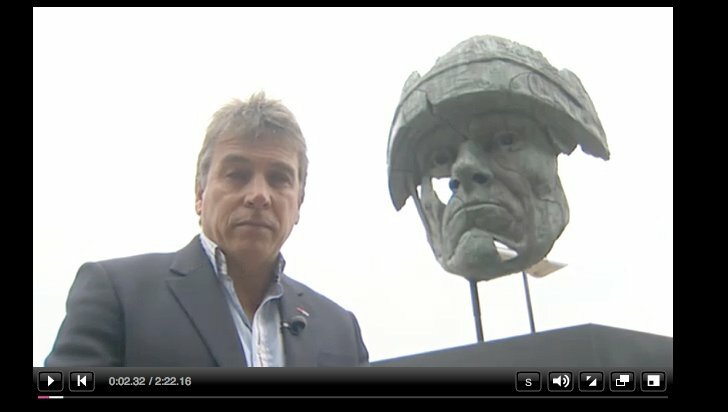 Lucy_Metcalf- The abandoned soldier is a great project and I feel that more people should be aware. Having viewed the statue I believe that it needs to be preserved for future generations to truly understand what the service men and women of the past and present have gone through. Deb Griffiths – This statue symbolises that veterans are not forgotten but recognised for the danger soldiers face daily so the rest of us can live in a peacefull and safe society. Without their relentless sacrifices and determination to make the world a safer place we would be under constant threat from those who choose to use violent means to hold the free world to ransom. I think preserving the statue is the least we can do as a symbol of recognition to those who chose to lay down their lives so we can enjoy the luxury of freedom. The Pillow Lady-I Believe that the Memorials of Remembrance to those that have sustained injury albeit, physical and or emotional, phsychological and or Spiritual, needs to be recognized. Here is America we have an amazing Patriot, Gary Sinise from the Lt Dan Band; Forest Gump movie, CSI that is our National Advocate for our Disabled for Life Memorial. It is an important tool to remind the citizens that Not just those that have perished should be Remembered, but those whom are surviving need Support, Respect & Appreciation. Troops train and do their Professional Best, but it is a Nation’s responsibility to provide the Tools to HEAL! I have been Blessed and both Honored to be involved with the Documentary by the BBC about “The Abandoned Soldier!” I am sorry to hear that your Nation is NOT embracing and accomplishing the simple mission of Honoring those that have Sacrificed so much! ALL Gave Some, Some Gave ALL! RESPECTFULLY, from across The Pond, Christina Finn The “Patriotic Pillow Lady!” Dedicated to our coalition Troops, and Defenders of Freedom! God Speed……….. This is just a handful of messages of support. The project would again like to thank everyone who is actively supporting TAS by commenting, taking time to write emails to people on our behalf and networking. We refuse to put TAS back in the cellar – he belongs somewhere where he can do his job! The Project are thrilled that a national newpspaper has run a story on TAS. Today we featured in the Independent On Sunday (see also online version). The story also featured quotes from Daniel Twiddy who TAS is modelled on. We are please to say Daniel has agreed to come on board and help the project move forward. We now have to decide our next move regarding TAS’s future so we will be meeting in the next few days to plan our next step in getting TAS bronzed and finding it a permanent home. Yorkie has since urged the 600+ members of the face book group to email the National Memorial Arboretum asking them to make sure that TAS will have a permanent home there. Covering the story was a news crew from Central television and a Photographer from the Express & Star. Mark also had an interview with BBC Radio Stoke’s Breakfast show that morning. The project would like to thank the Staff at the NMA for all their support, the poetry readers, Alison Jones for singing in the Millennium Chapel & Colin from West Yorkshire. We would also like to thank everybody who made the effort to come and make the day a success.